Introduction - Modifying lipids – why and how? Part 1 Understanding food lipid structure and composition: Vegetable sources of lipids; Lipids from land animals; Fish oils and lipids from marine sources; Lipids from microbial sources; Methods of analysis to determine the quality of oils; Selected topics in the chemistry and biochemistry of lipids; Structure and properties of fat crystal networks. Part 2 Modifying lipids for use in food: Hydrogenation of lipids for use in food; Fractionation of lipids for use in food; Chemical and enzymatic interesterification of lipids for use in food; Plant breeding to change lipid composition for use in food; Modifying fats of animal origin for use in food; PUFA production from marine sources for use in food; Production, separation and modification of phospholipids for use in food. Part 3 Applications of modified lipids in food: Trans-free fats for use in food; Reduced and zero calorie lipids in food; Filled and artificial dairy products and altered milk fats; Chocolate and confectionary fats; Developments in frying oils; Speciality oils and their applications in food; Applications and safety of microbial oils in food; Use of marine PUFA concentrates. Oils and fats have a major impact on the nutritional and sensory quality of many foods. Food manufacturers must often modify lipid components or ingredients in food to achieve the right balance of physical, chemical and nutritional properties. Modifying lipids for use in foods reviews the range of lipids available, techniques for their modification and how they can be used in food products. Part one reviews vegetable, animal, marine and microbial sources of lipids and their structure. The second part of the book discusses the range of techniques for modifying lipids such as hydrogenation, fractionation and interesterification. Finally, part three considers the wide range of applications of modified lipids in such areas as dairy and bakery products, confectionary and frying oils. 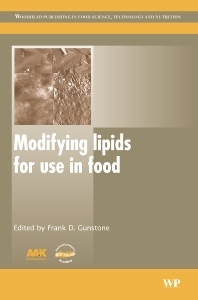 With its distinguished editor and international range of contributors, Modifying lipids for use in foods is a standard reference for dairy and other manufacturers using modified lipids. Frank D. Gunstone, Scottish Crop Research Institute, Dundee, Scotland.